Choosing a whisk can be a challenge. The varieties are wide and the prices... at times, can be as different and confusing as the type, make and model. Some whisks are longer and narrower -- others are like big balloons. Some are flat, (yes, flat) and some are coated with silicone for use on non-stick surfaces. Some have mini wire balls inside the main whisk as a way to increase the air, and as a result, the volume of whatever your whisking. But I have never found these to be useful, just allot of work at clean up time, and they really don't whisk that much more air. Use the "ballooningest" ones when you want to beat a lot of air into a mix, such as whipped cream or meringue. 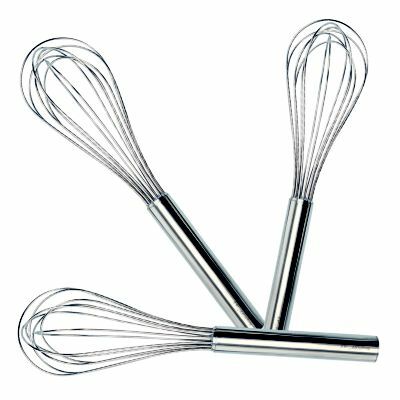 Choose whisks with thin and flexible wires for whipping air into batters, and thicker, more rigid wires for thicker mixtures such as brownies. Choosing the right whisk should be based on what you, as a chef, do most in the kitchen. Do you whip egg whites? Or are you using the whisk for making soup? Each has a purpose and each has the desired ability to achieve your goal. In the Kitchen I usually two kinds of whisks. My primary and all trusted is the French whisk. It's firm wires can cut thru some of the thickest creams and sauces and heavy soups. 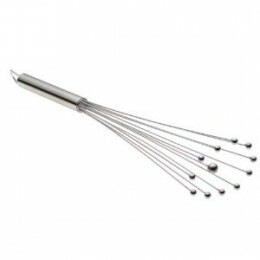 While I tend to use a balloon whisk for egg whites, meringue and making thinner sauces. I have tried a silicone whisk, and have used them on non-stick pans, but generally non-stick surfaces are a luxury in a restaurant kitchen where most pans are aluminum and often pretty beat-up. Clean up should be another factor in buying a whisk. Oh a whisk can be very detailed and have "cages" inside the balloon that claim to enhance the whip, but after it all said and done those "cages" can get filled and are often VERY hard to clean out. More so, if your mixing batters and thick sauces. 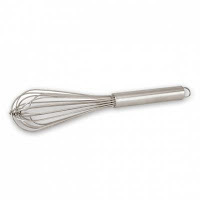 So while it's important to know the types and uses of a whisk, the question remains... Do you really need a whisk? The simple answer??? No! While it may be useful, many a family have used just a fork for whipping eggs, mixing brownies, or combining biscuit dough. Now a days, there are those that can combine the whisking action with the stand mixer as a separate attachment, or use the power of a hand mixer with its double beaters capable of turning a pint of cream into a gallon of whipped delight. 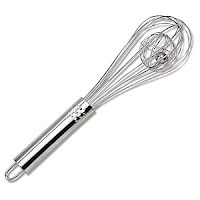 So what even your choice of whisk, if you use it, it becomes a valuable team member in the kitchen. If you don't use it, it becomes another item destined for the gadget drawer of useless tools.